a reduction in congestion at the boat ramp and headland as much as is possible given the capacity of the headland. Avoidance of unacceptable heavy vehicle increase to and from Mission Beach and through the village and cassowary habitat both in the construction phase and ongoing. 1. Finish the Perry Harvey Jetty with buffer pylons suitable for the open lee shore it is built in and with staged landings designed for current tourism boating needs. 2. 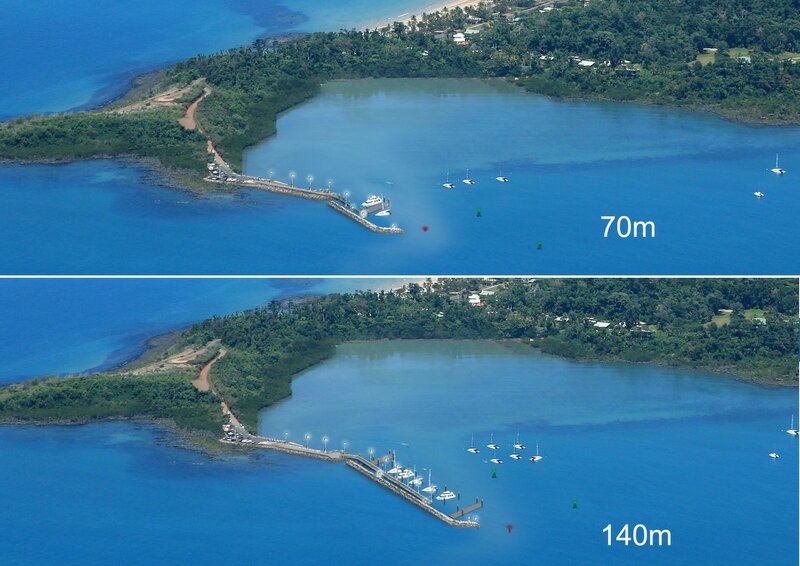 Extend existing rock wall to the minimum size necessary to accommodate a foot bridge, landing pontoon to cater for short term commercial tourism boats at those time when the jetty is less usable. I e when north easterly winds create a chop at the jetty ( short period of time (if any) at the end of the year and when there might be an onshore swell. 3. Establish regulation seagrass friendly moorings within the GBRMP designated area to overcome the problems of boats using inadequate moorings which have led to vessels either dragging anchors or moorings to end up on the rocks.